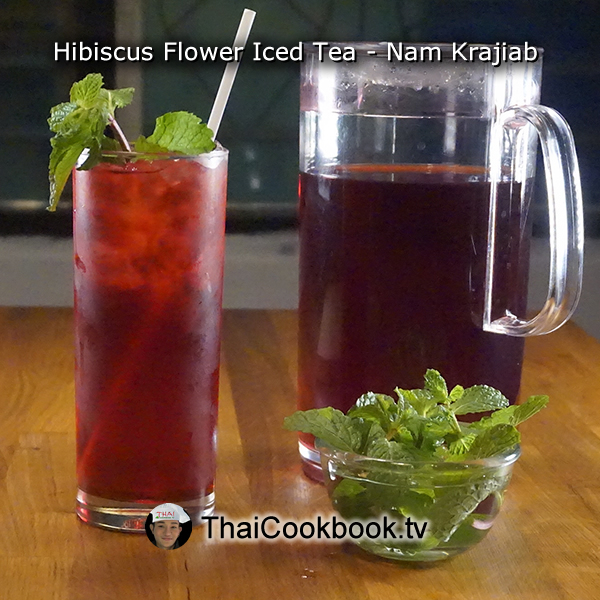 In Thailand we make an herbal infusion drink from the sepals and calyces of the flowers of the roselle plant, a type of hibiscus. 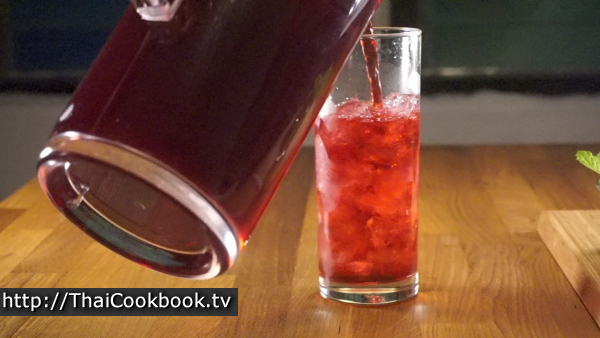 The dried flowers are boiled in water for 8 to 10 minutes, making a bright red drink that has a sour, tart flavor that many people say is similar to cranberry. While it can be served as an invigorating hot tea, most people like it as an iced drink with lots of sugar. Known here as Nam Krajieb, Thais consider it a healthy drink that is used for treating loss of appetite, colds, heart and nerve diseases, upper respiratory tract pain and swelling and inflammation, fluid retention, stomach irritation, and disorders of circulation; for dissolving phlegm; as a gentle laxative; and as a diuretic to increase urine output. Some researchers think that chemicals in hibiscus might be effective in treating certain conditions, although the scientific data has been inconclusive. 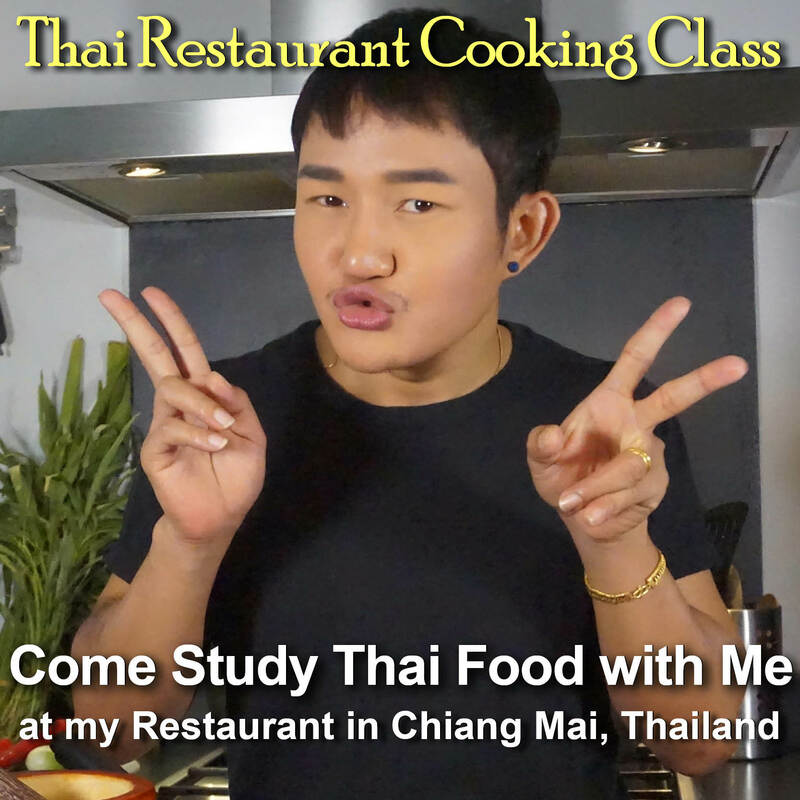 The drink is quite simple to make, and will add an authentic flair to your next Thai meal. What's in our Hibiscus Flower Drink. How we make our Hibiscus Flower Drink. 1) Boil 1 liter of water. 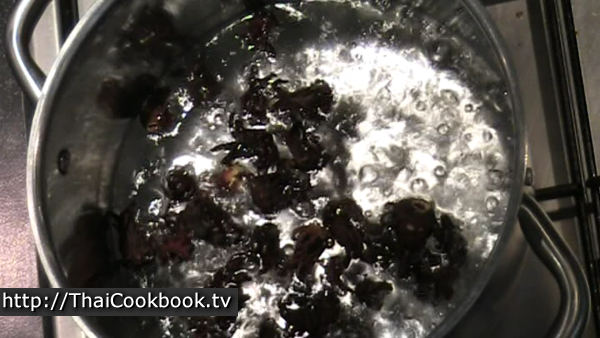 Add the dried roselle and boil hard for about 5 - 8 minutes, or until the water is dark pink. 2) Remove the flowers with a slotted spoon. 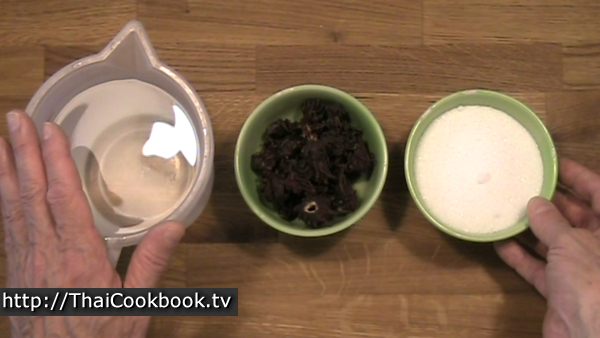 Add sugar as desired, then top off with water to make a total volume of 2 liters of drink. 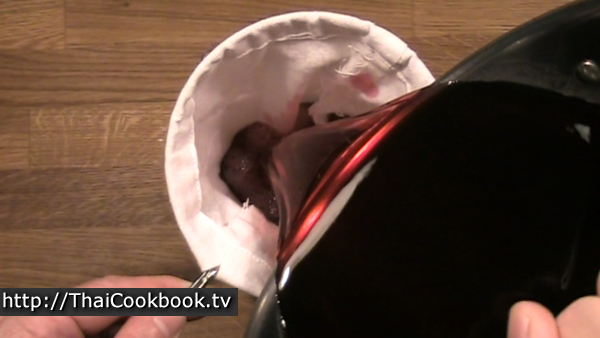 Allow to cool, then filter through a cloth bag or strainer. 3) Refrigerate until ready to serve. 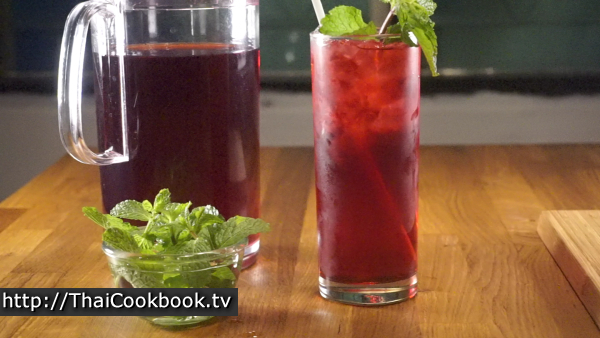 Serve over crushed ice with a sprig of mint. 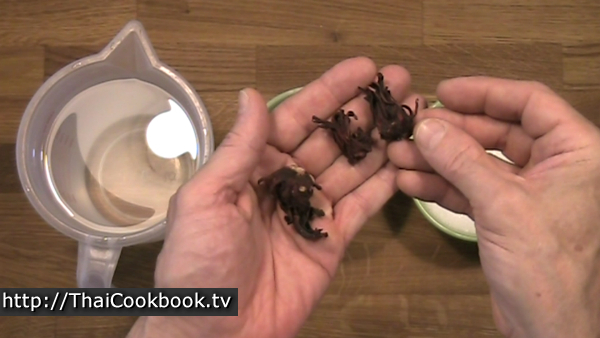 For this recipe I'm using dried, whole roselle. You'll often find it packaged in broken pieces, more like a tea. Either way this recipe will work fine, but if yours is broken up then you'll need quite a bit less than the 1 cup I have listed in the ingredients. For the size I have here, I can fit about 10 - 15 flower sepals in 1 cup. 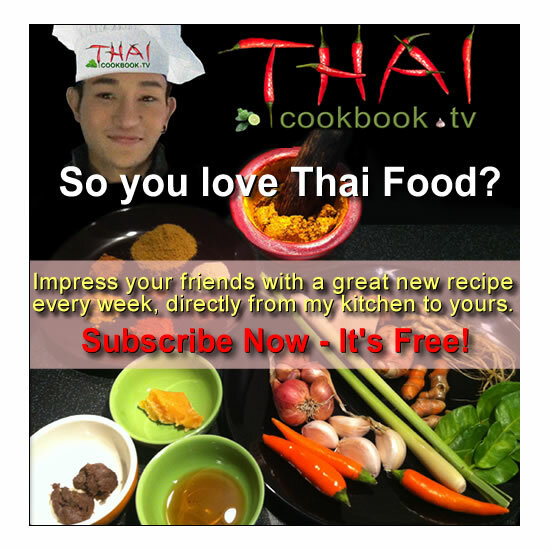 We like our Nam Krajiab quite sweet. The drink is quite sour without sugar, but some people like it that way. If you want a sweet "iced tea" type drink, then I recommend starting with 1/2 cup of sugar for 2 liters of drink and adding more if you think it will be better. Boil one liter of water, then add the flowers, boiling on high for about 5 - 8 minutes. Scoop the flowers out with a slotted spoon. The drink should be a bright pink to dark red color. While still boiling, add the sugar to the water. Add more water to until you have a total volume of 2 liters. When the sugar is dissolved completely, turn off the heat and let it cool to room temperature. Pour it through a cloth filter or tight mesh strainer to remove any remaining flower particles. Refrigerate in a closed container until ready to serve. Always serve in a tall glass over crushed ice to show off the vibrant color. A sprig of mint in the glass will make it look pretty.